You are currently browsing the tag archive for the ‘Sirenland’ tag. You work out five days a week, you do a fair job in the nutrition department–you consider yourself to be in good shape. That is, until you find yourself at a writers conference in Positano, Italy, and one of your fellow fiction writers (yes, I’m talking about you, Cindy Martin!) casually mentions she and some others will be walking up to the hamlet of Montepertuso for lunch. Would I like to come along? There’s a terrific restaurant up there. Well, yes I would, thank you very much! And my new friend, Holly, you come, too! As soon as our workshops broke at 12:30 then, off we went. Cindy and her husband, Cal, led the way for the half dozen plus of us who came along that day. They’d been to the conference before and had done this hike several times then, and they had done it the day before as well. How tough could it be? Montepertuso sits 1,137 feet above the Mediterranean, a fact I only learned after I was home and googled it, but even now the height doesn’t seem very daunting. High enough to afford spectacular views, but don’t I sometimes climb 2,000 feet on the treadmill at my gym back in New York? Well, bless that treadmill and its smooth rubber belt, its rhythmic pace, its predictability. Fifteen hundred steps. A couple hundred less, incidentally, than the more famous 1700 steps that lead from Positano to Nocelle. Ten minutes in, I used the excuse of a photo opp to collapse against a wall and let my lungs do their work. I couldn’t remember the last time I’d been so out of breath. How much longer, I inquired of Cindy and Cal, those show-offs at the front of the pack. I was going for a breezy tone, but instead I was wheezy. Cal threw me a smile over his shoulder and laughed, brushing my question off as if it were merely rhetorical. Holly came over to lean against the wall with me, shooting me a look I read as, what did you get us into here? I liked Holly. I hoped she wouldn’t hold this all against me. Yet, though I would barely have thought it possible, the view as we ascended was even more stunning than it was down at our hotel. The sun danced on the sea and dazzled the multicolored jumble of houses on the mountain opposite. 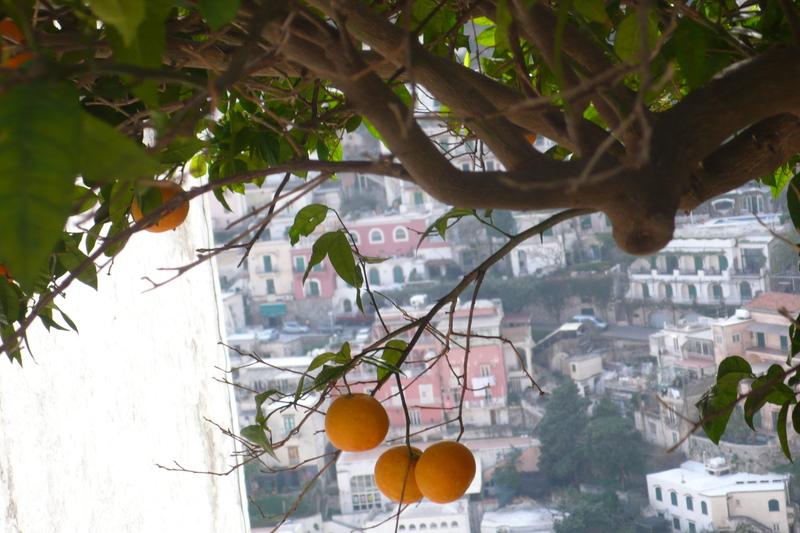 We were surrounded by citrus trees, lemon and orange, and in the narrow stone lanes, soccer shirts and jeans and sheets hanging on laundry lines frolicked in the refreshing pre-spring breeze. We took our pictures, we caught out breath, we were ready again. This wasn’t so bad. Really it wasn’t. Not five minutes later and already my breath had deserted me again. I couldn’t afford any more conversation if I was going to make it to the top. We were all new acquaintances, anxious to get to know one another, but that would have to wait. I wouldn’t be able to talk to anyone when I was dead. Presumably, if you climbed without stopping it would take about half an hour to reach the top. We set foot in Montepertuso about 45 minutes after we began. But we made it. My clothes might have been soaked through with my exertions, my hair might be dripping down my neck, but we had reached our destination and in just a few steps we’d reach the restaurant where we’d cancel out everything we’d just accomplished with a feast, Italian style. Holly and I attempted as best we could to take a shower in the bathoom sink and when we went out to the dining room, the smiling Paolo welcomed us with a glass of Prosecco. Now this was my kind of place! Il Ritrovo (www.iltritrovo.com), which means the meeting place, is special. I’d be lucky enough to eat here twice during my time in the area (yes, I undertook the hike a second time). Because we were a large group, Paolo suggested he bring us large platters of antipasti, followed by a variety of homemade pastas. First there were plates of fresh seafood–marinated anchovies, shrimp, mussels, icefish (that was a new one for me)–and charcuterie–prosciutto, speck, salami. There were grilled vegetables and there were cheeses. Pastas included a linguine with fresh mussels, a pasta with a simple but divine cherry tomato sauce and, the hands-down favorite, a thick tube pasta with a cream sauce of provolone and walnuts. And all the while, the wine flowed as freely as the conversation. Afterward there were cookies and biscuits and tiny cakes along with not only the ubiquitous Limoncello but homemade liquers made of blueberry and apricot. 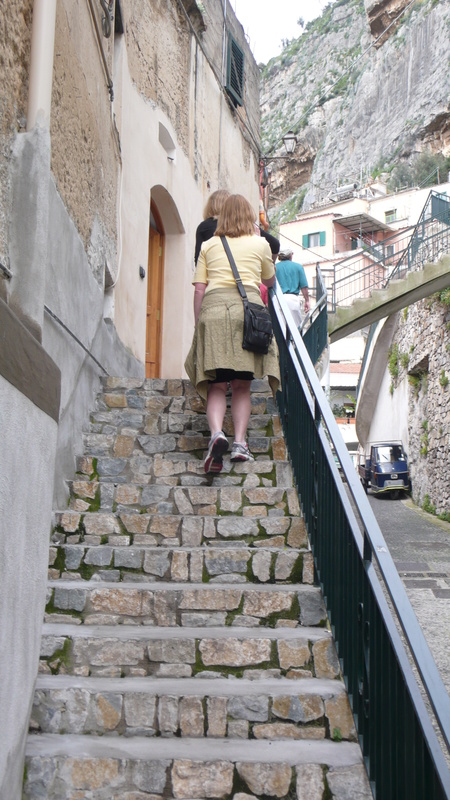 We didn’t want to leave–ever!–and not just because we were thinking of the long walk back down to Positano (a walk that would seem easier, but just have a little heart-to-heart with your knees and see what they think). Just outside the restaurant, near the railing overlooking the sea more than a thousand feet below, we gathered together so Paolo could snap our picture. I will treasure this photograph always, not only for the memory of that hike, of that meal, but because it contains the smiling faces of some of the new friends I made on my trip–new friends who I hope to be calling old friends years down the road. I see it in my mind. Five or ten years from now, at one of our book signings. “That was funny,” I’ll say, probably with tears in my eyes, because I’m sappy that way. I was fortunate enough recently to attend the Sirenland Writers Conference (www.sirenland.net). 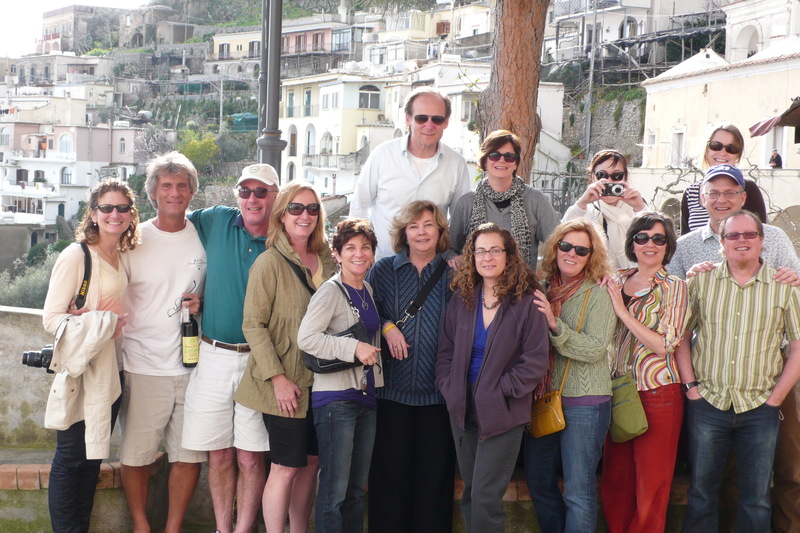 As if spending a week with a few dozen super talented writers were not enough to make the conference worthwhile, the event takes place on the Amalfi Coast of Italy, in breathtaking Positano. With a reputation as a resort area for the Beautiful People (that is, beautiful and rich), a place like Positano is the stuff of dreams for a middle class girl like me. 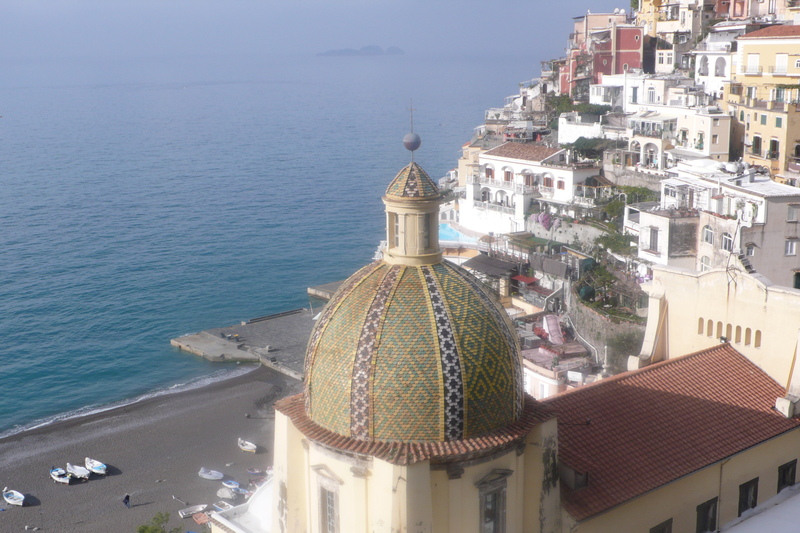 Which is to say, just the thought of going to Positano already had me swooning. We’ve all seen the pictures of the colorful houses perched one atop the other up the sides of the cliffs, as if to add just one more might send them all toppling. 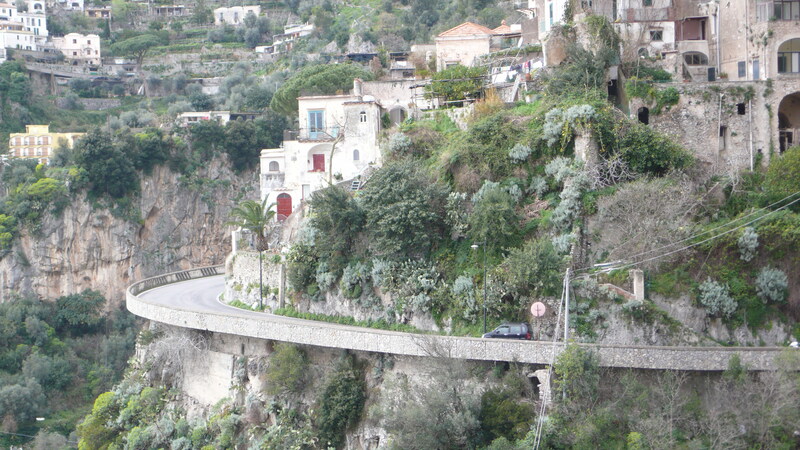 In old Italian movies, we’ve seen the twisty roads high above the Mediterranean that hug the Amalfi Coast (bring the Dramamine!). But, oh, the surprise in store for me when I checked into the hotel (albergo) where the conference is held. 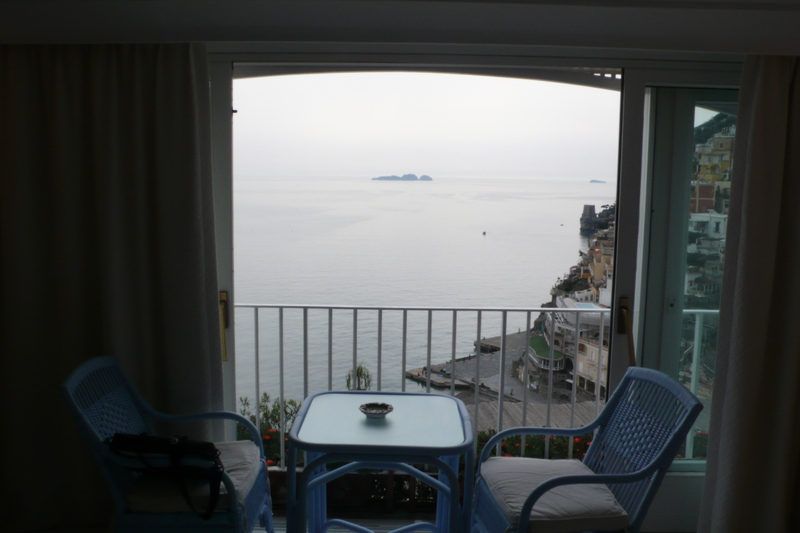 Le Sirenuse (www.lesirenuse.com) is one of, if not the, most luxurious hotel in Positano. In the week before the hotel opens for the season, the Sersale family hosts the Sirenland Writers Conference in high style–and with such graciousness and enthusiasm for the art of writing literature. 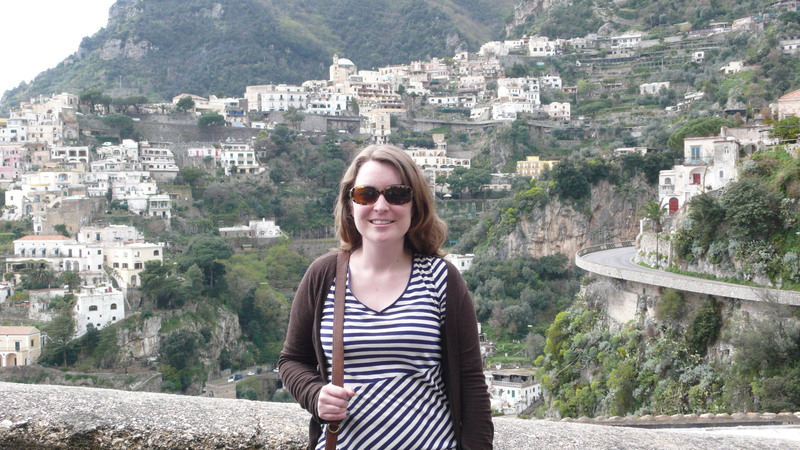 Prior to arriving in Positano, I’d spent three days traveling solo in Capri. That morning, I’d taken the ferry from Capri to Sorrento (in season, there is a direct ferry to Positano) and then the bus to Positano. I was exhausted when I arrived, having done quite a bit of traveling (and hiking) in those days. At the front desk, Gennaro was all smiles and ready to check me in. Leaving my luggage behind in the lobby (someone would deliver it to my room), Gennaro led me through the stunning lobby area, down a flight of marble stairs and through a maze of opulent sitting areas to room #91. He opened the door, we walked the few steps down the short hallway and then turned the corner. Perhaps my exhaustion had brought my emotions closer to the surface, but tears came to my eyes at the sight of this room–and the view beyond. Never in my life could I have imagined I would ever stay in such a place. I felt–for lack of a better word–undeserving. First of all, the size. The room was almost as large as my entire apartment here in New York (which, I realize, isn’t saying all that much!). In addition to the huge bed outfitted with Frette sheets and duvet and the world’s most comfortable pillows, there was a sitting area with a table, cushy love seat and two armchairs, a little dressing table area with a window overlooking the water, a desk, an armoire that spanned most of a long wall, and….best of all…sliding doors that opened to an expansive view of the Mediterranean Sea, the beach (the sand darkened by volcanic ash) and that ubiquitous cliff of precariously stacked houses. And I hadn’t even seen the bathroom yet, with its giant jacuzzi, its plush towels and robes and complimentary Eau d’Italie toiletries. Or the dining room downstairs, with its lemon trees, the vines climbing the walls, and the chandeliers of hundreds of candles. Or the myriad terraces, each offering slightly different views, all the more impressive than the last. Gennaro left me with my key, a heavy golden mermaid (le sirenuse) and immediately I took a picture of it. A minute later my suitcase arrived, but before I unpacked or did anything else, I shot photographs of every inch of my room, trying to make it seem real. Even after spending a week there, it still felt more like a fantasy. The room, the breakfast feast each morning, the conference itself, the new friends, the Baci chocolate waiting at my bedside each night–it all seemed part of some alternate life, a life I had somehow stolen and called my own. After I’d taken my pictures, I leaned on the railing in front of the sliding doors and stared at the beach, the hillside, the fisherman paddling his rowboat out to sea. It was cloudy, and cool, but it hardly mattered. I closed my eyes and breathed in the moist air, listened to the gentle crash of the surf against the shore. I left Le Sirenuse and Positano almost a week ago now. I have to keep reminding myself that I did not imagine it. For five days and six nights, I lived like one of the Beautiful People and I felt, well, special, as I’m sure all my fellow Sirenlanders did. And maybe that’s because we are.